All pups are quality bred, come with shots, wormed, shot and worming record, AKC registration priviledges and a very comprehensive 2 years guarantee. 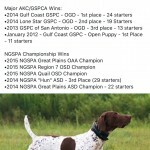 GSP male pups sired by AKC Grand Field Chapion “Prime Cut” are currently available. GFC/FC HK’s Prime Cut pups available. 4 females and 4 males born 11/ 23/2018. Ready now! 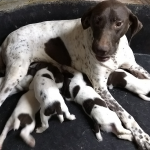 German shorthair Pointer pups available now! GFC/FC HK’s Prime Cut pups ready for new homes.